Easily the most controversial and speculated upon figure in pre–World War II Mississippi blues, guitarist and singer Robert Johnson was born on 8 May 1911 in Hazlehurst, south of Jackson in Copiah County. His recorded body of songs includes examples of instrumental virtuosity, emotionally evocative lyrical poetry, and spine-tingling vocal range. Nonetheless, his most successful record during his lifetime sold only about ten thousand copies, a modest figure even for the late 1930s. The bare facts of his short life offer little insight into his emergence as a transcendent musical figure, and the scant number of verifiable facts and the conjectural nature of most of the assembled biographical data contribute to the myths that complicate our understanding of his life. At least some of the mystery emanates from Johnson’s birth to Julia Dodds outside of her marriage to Charles Dodds Jr. Reliable recollections of Johnson’s childhood have been difficult to come by as he carried the last names Dodds, Spencer, and Willis before learning that his biological father was Noah Johnson and adopting that surname in his early teens. Johnson’s boyhood proved no more stable than his name. While his conception had occurred after Charles Dodds fled Hazlehurst following a feud with a prominent white family between 1907 and 1909, Julia and Charles Dodds reunited around 1914 in Memphis, where Charles had settled and adopted the last name Spencer. The reconciliation proved short-lived, and Julia was back in Mississippi, around Robinsonville in Tunica County, by 1918. By the early 1920s Robert was living with Julia and her new husband, Dusty Willis, on the Abbay and Leatherman Plantation. Johnson’s aptitude for music and reluctance to labor in either the cotton field or the classroom were apparent by the mid-1920s, and he drew inspiration and tutelage from elder musicians Son House and Willie Brown, both Robinsonville locals and barrelhouse performers born near the turn of the century. By 1929 Johnson’s personal life temporarily stabilized as he married and prepared for fatherhood, but his wife and baby died in childbirth in the spring of 1930. Immediately thereafter, Johnson left the Delta in search of his father in Hazlehurst. There, Johnson apprenticed with guitarist Ike Zinnerman and remarried, settling in South Mississippi. Whether he reunited with his father is unknown. In the 1960s House recalled that Johnson returned to the Delta after about six months, during which time Johnson became an expert guitarist. It seems more likely, however, that Johnson stayed around Hazlehurst for about two years—long enough to practice and hone his musical skills in an apprenticeship with Zinnerman. House’s mistaken reckoning of the amount of time Johnson spent away from the Delta provided anecdotal evidence for the Faustian explanation of Johnson’s talent that later arose—that is, that he sold his soul to the devil. The bulk of Johnson tales come from the period between his return to the Delta around 1932 and his death six years later. The number of 1930s bluesmen with stories about Johnson attests to the breadth of his travels and tells us something about his latter-day marketability. If accounts of Johnson’s activities are beyond verification, the experiences of his colleagues who lived to tell about their own careers at least offer details of the professional context in which Johnson operated. During the 1930s Mississippi’s African American musicians earned most of their income from live performances, meaning that substantial travel was required. Most, including Johnson, did not own cars and consequently traveled on foot, by rail, and by hitching rides. Musicians’ sporadic earnings compared favorably with those of day laborers, and musicians were often fed and housed during engagements. Though Johnson performed in St. Louis, Chicago, Detroit (on a minister’s radio program), and possibly New York, he made most of his living in Mississippi. Recording provided musicians with another source of income, and in 1936 Johnson made contact with H. C. Speir, a Jackson-based furniture and record store owner and self-styled talent broker. Speir had earned a reputation for arranging recording sessions for Mississippi blues musicians, and he referred Johnson to Ernie Oertle of the American Recording Company. Oertle invited Johnson to San Antonio, Texas, in November 1936 for a session at which he recorded sixteen songs, including the enduring “I Believe I’ll Dust My Broom,” “Sweet Home Chicago,” and “Terraplane Blues,” the biggest seller of his lifetime. Another number from this session, “Cross Road Blues,” has been cited as evidence of Johnson’s supernatural dealings, though the lyrics lack any otherworldly reference. Johnson recorded again in Dallas the following June, cutting the provocatively titled “Hellhound on My Trail,” “Me and the Devil Blues,” and eleven other songs. Enamored with Johnson’s recordings, producer John Hammond summoned him to New York City for the Spirituals to Swing concert, a December 1938 presentation of black music to New York’s elite at Carnegie Hall. But Johnson had died in Greenwood on 16 August 1938. According to legend, a juke joint operator poisoned Johnson’s whiskey after learning of the musician’s involvement with his wife. Johnson’s death certificate lists syphilis as the cause of death. 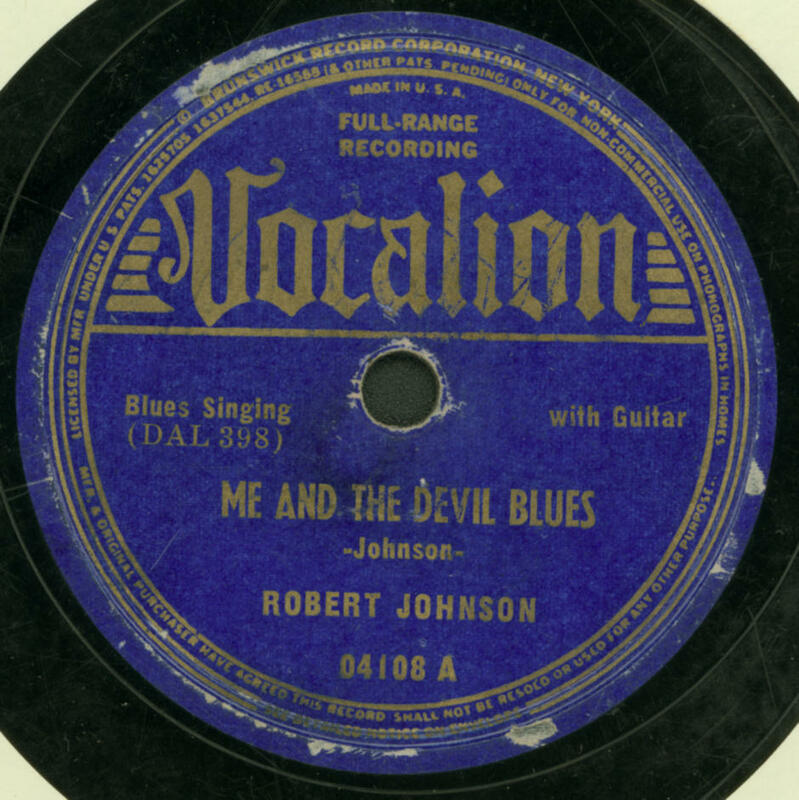 The Johnson legend grew with the blues revival of the 1960s, when significant numbers of white listeners became aware of pre–World War II blues recordings. The posthumous coronation of Johnson as King of the Delta Blues (a subgenre that never existed as such before the revival) followed. Ever-opportunistic bluesmen—storytellers and performers by trade and usually by nature—recognized the chance to elevate their status through association with Johnson, who fascinated many latter-day interviewers. Musicians unknowingly contradicted one another’s recollections and deliberately challenged the validity of others’ associations with Johnson. At the same time, an exotic interpretation of the blues began to emerge in revivalist circles, with Johnson among its most romanced figures. His untimely demise and lyrics concerning the devil (a common theme among his contemporaries) and the crossroads became conflated with African American myths about musicians trading their souls to Satan in return for accelerated abilities. The bluesman’s three gravesites are monuments to the unreliability of recollections about Johnson. Johnson’s death certificate lists “Zion Church” as his burial site, though none of the current markers sits at such a place.